COBRA motorized projection screensInnovative motorized screen with upwards unrolling system, self standing, suitable for attics installation and rooms with skewed ceiling; buildings of historical and architectural relevance and anywhere it’s impossible to drill holes in the wall or ceiling; theatres, cinemas and stages; yachts and boats; renting or service equipment.The raising of the projection screen is obtained through robust aluminium extension arms and gas springs, while the closing is managed by a powerful and silent electric motor - The COBRA screen structure is self standing and therefore it can be placed on the ground. It can be fixed on the ground with appropriate anchoring screws. 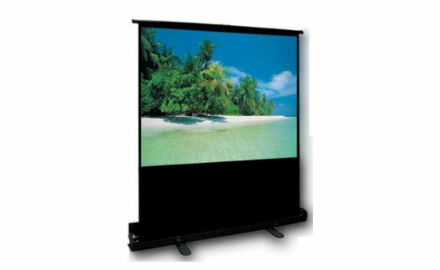 Depending on the installation type and the use, it’s possible to build around the screen base a false floor made out of plaster, or embedding it into the floor - The COBRA screen is standard available with Soft Matt White projection fabric, with or without black borders (cm 5) and lower black drop variable height depending on projection format - Screen up and down limit switches factory adjusted, electric switch and instruction standard supplied - 12 months total warranty on the screen and 5 years on the electric motor. Product CE certified - On demand: radio remote control or radio remote receiver integrated in the electric motor and transmitter. Ligra 702783 schermo a pantografo da 60"
Ligra 702883 Schermo a pantografo da 80"
Ligra 702983 schermo a pantografo 100"